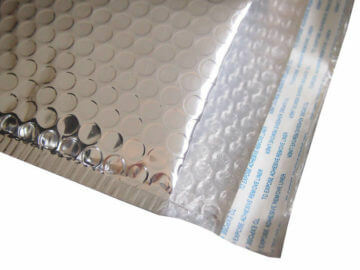 These shiny metallic bubble mailers are sure to get noticed as they are delivered from your business to your customer’s doorstep. The Metallic Airjacket is not just pretty; it’s the strongest mailer in our product line. With a unique blend of metalized polyester and low-density polyethylene for extra rigidity and super strength, your package will look great and have superior protection. This mailer’s ultra-rigidity is the perfect solution for preventing crushed edges on items such as cosmetics, jewelry, books and items in decorative exterior boxes. 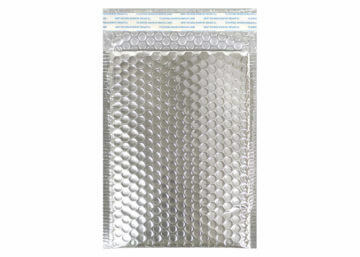 Metallic bubble mailers do double duty as mailer and decorative gift wrapping in one! Sending a gift to someone? Eliminate the need for gift wrapped boxes, air filled pillows, packaging peanuts or crumpled kraft paper and stop over packaging. Not only will you decrease DIM weight costs by downsizing to mailers, but you will decrease your total carbon footprint as well. A simple, yet effective, pressure sensitive, tamper-evident seal provides a reliable and convenient closure, keeping products safe throughout shipment. The quick release seal liner facilitates an efficient packaging process. Constructed with a unique blend of metalized polyester and low-density polyethylene for extra rigidity and super strength the Metallic AJ will protect the edges of decorative boxes and books.